Our collaborative exhibition with Centre for Advanced Textiles just loves alliteration! The exhibition focuses on mid 20th century textile design and can be visited it in the School’s Reid Building corridor until the 8th of October 2017. New wall hangings, cushions and tea towels available to buy from Centre for Advanced Textiles. 2017 mark’s the centenary of the highly influential and pioneering pattern designer, Lucienne Day (1917-2010). 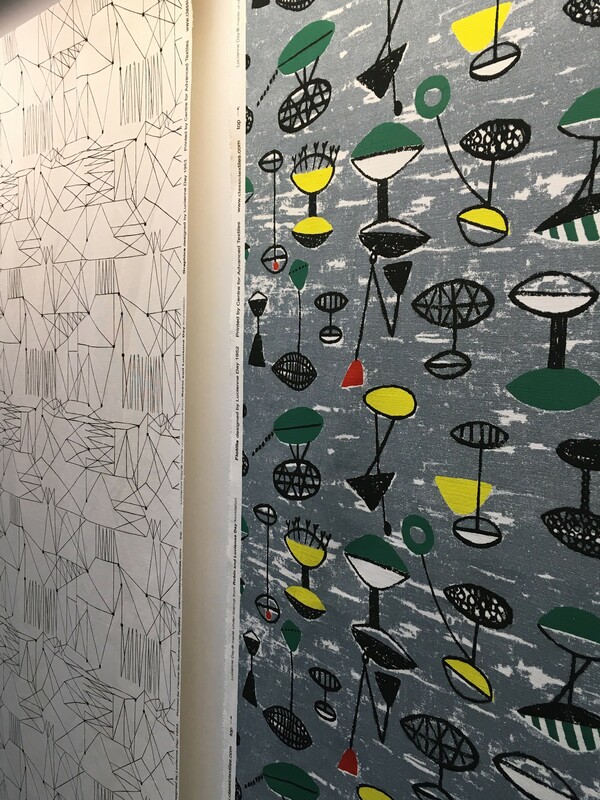 Working with The Robin and Lucienne Day Foundation, GSA’s Classic Textiles by the Centre for Advanced Textiles (CAT), produce the world’s only licensed digital reprints of Day’s iconic 1950s-60s furnishing fabrics. The centenary has provided the opportunity to delve into GSA’s Archives and Collections to look at the work of some of Day’s contemporaries. This exhibition presents archival materials alongside products developed by CAT, inspired by the work of mid-20th century females designers represented in the School’s archive. 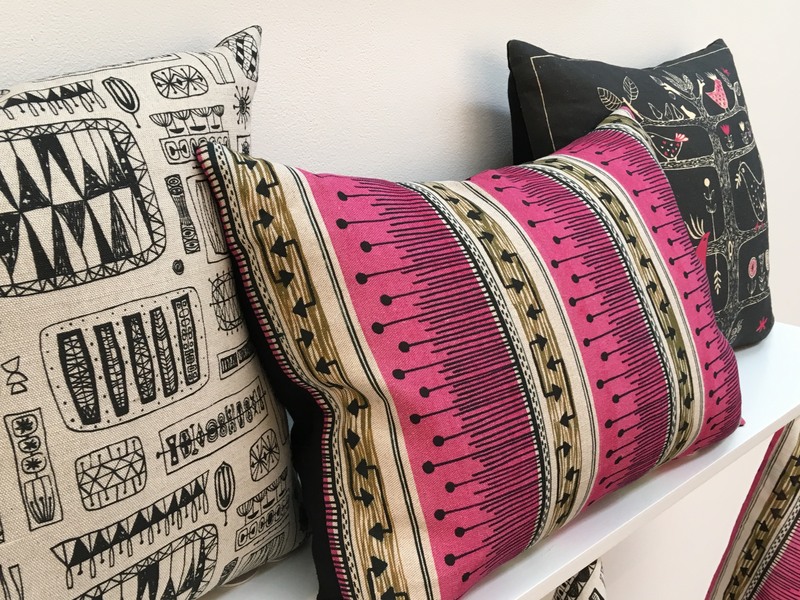 The textile designs of GSA alumnae Sylvia Chalmers, Dorothy Smith and Margaret Stewart demonstrate an eclectic mix of vibrant colours and abstract patterns. Some of these designs have never been previously produced as textiles but are now being adapted for 21st century use. Cushions, tea towels, canvases and fabric by the metre are for sale. Sylvia Chalmers was a student at the Glasgow School of Art in the late 1940s. She moved to London in 1951, where she designed fabrics for Heal’s. 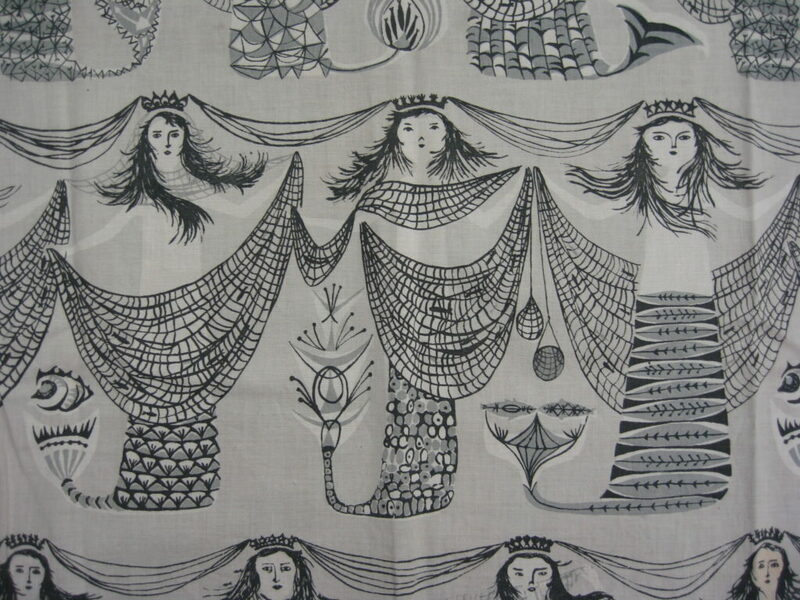 She won three medals for her textiles designs shown at the Milan Triennale in 1954. In 1955 she founded her textile printing company in Scotland, Tuar Fabrics, which she ran for over 20 years, often selling her textile designs for fashion use to Elizabeth Eaton. In 1976 Chalmers purchased Blacknest House at Thornhill in Dumfriesshire and converted the out-buildings into a design and production complex. 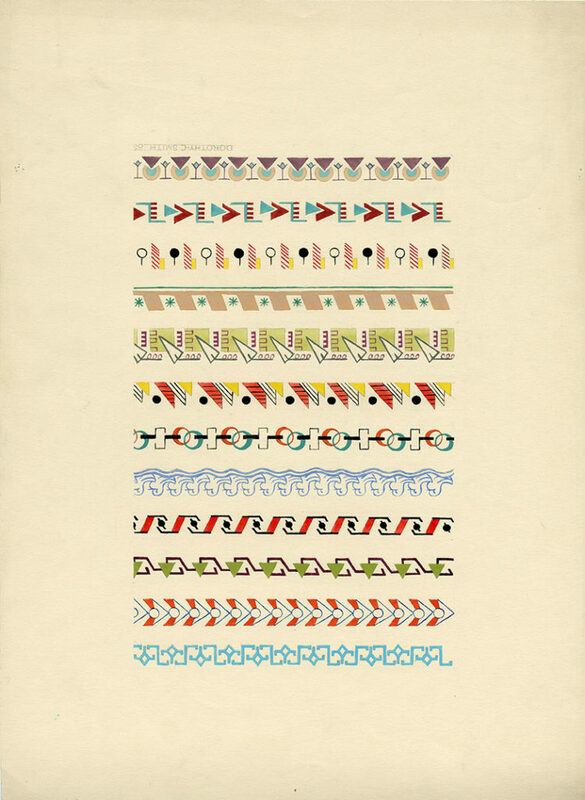 In recent years twelve of Chalmers’ textile designs from the 1950s and 60s have been digitally reproduced by the Centre for Advanced Textiles at Glasgow School of Art, making her designs available to buy once more. Her influential and distinctive designs have been discussed in several recent publications including “V&A Pattern: The Fifties” (2009) and “Twentieth Century Pattern Design” (2011). Dorothy Campbell Smith was born in Partick and attended Hyndland School. She entered Glasgow School of Art in 1940, where she changed from the Painting department to study design, and specialised in embroidery and weaving. As it was wartime she spent many nights firewatching on the school roof, and during the holidays worked in forestry in the Trossachs and Argyll. On completion of the course in 1944, she was awarded the Newbery Medal for distinction in diploma work. After teacher training at Jordanhill College, she taught at Glasgow’s Whitehill School from 1945-1949 and gave embroidery evening classes at GSA. Whilst teaching at St Rollox School in 1950 she cut her finger while clearing out art room cupboards. The infection gave rise to an epidural abscess, which caused total paralysis. She spent the next two years as a patient, mainly in the neurological surgery unit at Killearn Hospital. She told her surgeons that if they could restore function to the thumb and index finger of her right hand, she could still use a needle. Other operations and Smith’s fortitude enabled her to eventually regain mobility. By 1956 she had succeeded in convincing the education department that she was physically fit enough to resume teaching and was appointed to Hamilton Crescent School, followed by Hyndland School until she retired. She died in 2008. Margaret Stewart (married name Beck) studied at The Glasgow School of Art from 1949-1954 under Bob Stewart (no relation). She completed a diploma in Textiles in 1953, and a post-diploma in 1954. Students wanting to complete a diploma course were first required to complete the general course, all in all two years of full time study. During the 3rd and 4th years the studies were restricted to a main subject and one subsidiary craft. The best students who completed the diploma course could remain for one additional year to complete a post-diploma course. Students specialising in Textile Design and Fabric Printing were “trained to produce designs suitable for present day markets”, and had to also study the “technical aspect of their subject in classes held jointly by the Glasgow School of Art and the Royal Technical College, Glasgow”. The Glasgow School of Art Archives and Collections online catalogue. Thanks to Helena Britt for providing additional information.